The Romanian plum was sweeter than the German version I tasted, but its texture did not match the French variety, while it had a different colour from the Spanish one I sampled earlier. My untutored taste buds were being truly put to the test as I strolled round Brogdale Farm in Kent, in the company of its chief guide Ted Hobday. 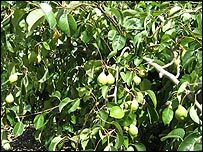 My only regret, as I surveyed the vast array of fruit before my eyes, was that the Ukrainian pears would not be ready to eat until December. 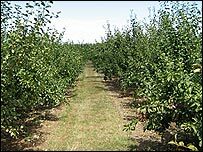 If Kent is the garden of England, Brogdale is its most unusual and distinctive orchard. For more than 50 years, it has been home to the UK's National Fruit Collections. These make up the world's most significant gathering of temperate fruit varieties, an unmatched horticultural and scientific resource owned by the government and run by the Brogdale Horticultural Trust, in association with Imperial College, London. Growing on 150 acres of land near Faversham are an incredible 2,040 varieties of apple, about 600 of which originate in the United Kingdom. Add to that 502 varieties of pear, 322 types of cherry and a host of less well-known fruits such as quince, perries and medlars, then you have a temple of fruit to make any connoisseur's mouth water. 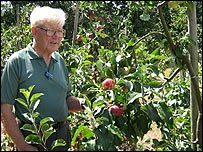 "If you wanted a Bloody Ploughman apple or a Gascoigne Scarlet you probably wouldn't get it anywhere else but here," says Mr Hobday, whose team show 50,000 visitors round the site a year. "We are in the business of supplying older varieties which aren't grown any longer." Brogdale has a unique position in the horticultural landscape of Kent, which is the UK's largest supplier of apples, cherries and several other types of fruit. Its primary responsibility is to maintain the 150-year National Fruit Collection on behalf of the Department for the Environment, Food and Rural Affairs (Defra) - an undertaking seen as something of a labour of love by the organisation's 12 full-time staff. Maintaining the collection - made up of two trees from each variety collected down the years - is essential to preserving the genetic diversity of fruit crops. It also helps to improve "nutritional availability" in UK, Defra says. This task is growing in importance as climate change threatens to significantly alter the amount and type of fruit which can be grown in the UK and across Europe over the next 50 years. 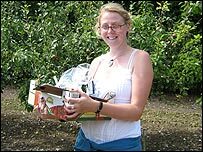 Brogdale is well situated for this monitoring role, having recorded the highest temperature seen in Britain of 38.3 degrees Celsius in 2003. The National Fruit Collections were set up in west London in the early 19th Century by the Horticultural Society. Its first catalogue, published in 1826, listed 1400 apple cultivars. The Collections moved to Surrey in 1921 and to Brogdale in 1954. Although temperatures haven't risen quite as high this summer, the July heat wave produced a bumper cherry crop. But Mr Hobday and his colleagues are worried that a lack of rain will detract from this year's harvest of apples and pears. "When you see the gene bank as a living thing, with changing climatic conditions, you can see all this happening," he says. As part of the 1990 agreement which saw ownership of the site pass from the state to a charitable Trust, Brogdale has to fulfil a variety of other obligations. It is expected to act as an educational resource, something it does by hosting various classes for local schools and colleges. It is also entrusted with spreading horticultural knowledge, meaning its experts are on call to identify types of fruit found by people and analyse less than perfect samples. As a limited company, Brogdale also has scope to grow commercially, although all the income it raises goes directly to supporting its facilities. Its business activities are small-scale but far from uninteresting. One recent growth area is advising heritage bodies and wealthy individuals on how to recreate orchards in historic homes. Experts identify which varieties of fruit were grown in orchards at a certain period of time and try to simulate them in today's conditions. 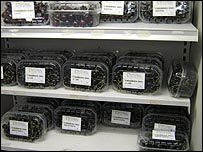 Brogdale also sells graft wood - a way of propagating fruit - to nurseries as a first stage in reintroducing certain rare varieties into the food chain. As well as selling cherries, jams and preserves to its visitors, the farm is also a niche supplier of products to retailers including Tesco, Waitrose and Fortnum & Mason. Several of London's top restaurants are also customers. They are all attracted by the exceptionally rare varieties Brogdale grows - only one commercial quince grower exists in the UK - and by once common types of apple such as Blenheim Orange which are no longer so widely cultivated. These activities do not clash with those of Kent's commercial farmers, Mr Hobday insists, since the latter are operating in a different marketplace driven largely by volumes. "We have to be commercial in the sale of our fruit but there is no rivalry. Commercial farmers can only grow what the marketplace is going to buy from them," he says. Brogdale is largely insulated from the rigours of the market, where cheap imports and the buying power of supermarkets have made life extremely difficult for Kent's fruit farmers. Commercial orchard numbers have shrunk dramatically in recent years as businesses have been rendered uneconomic by the changing face of the High Street, and consumer demand for fresh fruit all the year round. "The very small and the very big seem to survive but it is the ones in the middle which have been giving up in large numbers," says Mike Austen, Brogdale's orchard consultant, who quit his own farming business four years ago. But he believes local farmers are becoming more competitive and will be helped by greater public awareness of environmental issues and support for local produce. "Cherry trees are starting to be planted up again and more is coming onto the market. People realize fruit travelling vast distances is not a good idea and are buying locally."